If you couldn’t tell, I’m a big fan of grilling. Whether it’s summer or winter, you can always find me behind a grill. There’s something about cooking over an open fire. Food just seems to taste better. Given my love for grilling, it’s no surprise how much I’ve been enjoying my new Traeger. It runs off of wood pellets and allows for grilling as well as smoking but has temperature controls that allow for enough precision for it to essentially be used as an oven. It’s definitely one of my favorite kitchen toys. This is my first recipe using the Traeger but you can definitely expect more in the future. I’ve made some killer smoked briskets with it as well as some of the best chicken I’ve ever had. On to the tacos…. I’ll be honest, I typically don’t love cooked salmon. These tacos are a different story though. I’d happily eat this salmon all day long. Cooking it on a smoky grill with a simple, yet flavorful spice rub really takes it to the next level. Another big thing with cooking salmon, or any fish for that matter is to not overcook it. Salmon easily dries out, and becomes unpleasant if its cooked too far past medium rare, at least as far as my tastebuds go. Also, use the freshest salmon you can get your hands on. It makes a big difference. An instant read thermometer is your friend. If you don’t have one I highly recommend the Thermapen or Thermapop from Thermoworks, I use the thermapen on a daily basis. 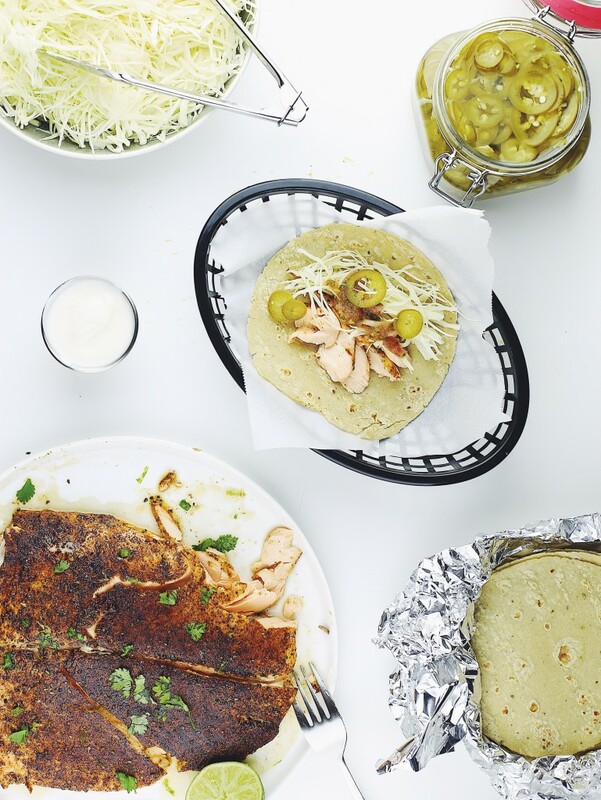 The salmon is definitely the star of these tacos but the salsa is a close second. Charring the vegetables over a smoky grill really gives the salsa smokiness that you can taste. I like to leave most of the seeds and membrane in the jalapeños but it does end up pretty spicy that way. If you’re not a big fan of spice, I’d recommend scrapping the inside of the jalapeños out before everything goes in the food processor. You can also make the salsa a few days in advance and keep it in the fridge. It makes for super quick weeknight meal if everything is ready to go. Same thing with the spice rub. 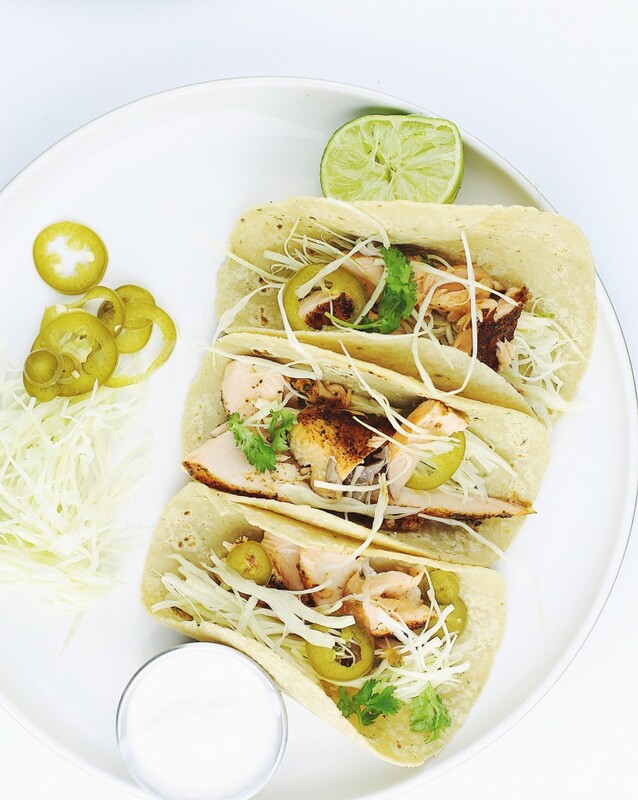 Make a batch of it in advance and there is almost no prep for these tacos. I like to top the tacos with shredded cabbage and a bit of fresh cilantro but you can top them with whatever you happen to have on hand. To make the spice rub, add salt, ancho chili powder, smoked paprika, brown sugar, garlic powder, oregano, and cracked pepper in a bowl. Stir to combine and set aside. Preheat grill to about 275°F . Score an “X” on the bottom of the tomatoes and brush the vegetables (tomatoes, jalapeño, red onion) for the salsa with olive oil and sprinkle with salt. Place them on the grill for about half an hour. They are done when they have started to soften and are beginning to char. We aren’t trying to blacken the vegetables, we are just giving them a smoky flavor. Remove the vegetables and allow to cool until they can safely be handled. Peel away the skin of the tomatoes and remove the seeds and the membrane of the jalapeño if desired. Add them, along with the onion and cilantro to the bowl of a food processor and pulse until everything is roughly chopped. Squeeze in the lime and drizzle in 1-2 tbsp of olive oil and continue to pulse until your preferred texture. Taste, and season with salt and pepper. Transfer to bowl and set aside, or store in fridge until ready to serve. Increase the heat on the grill to 400°F. 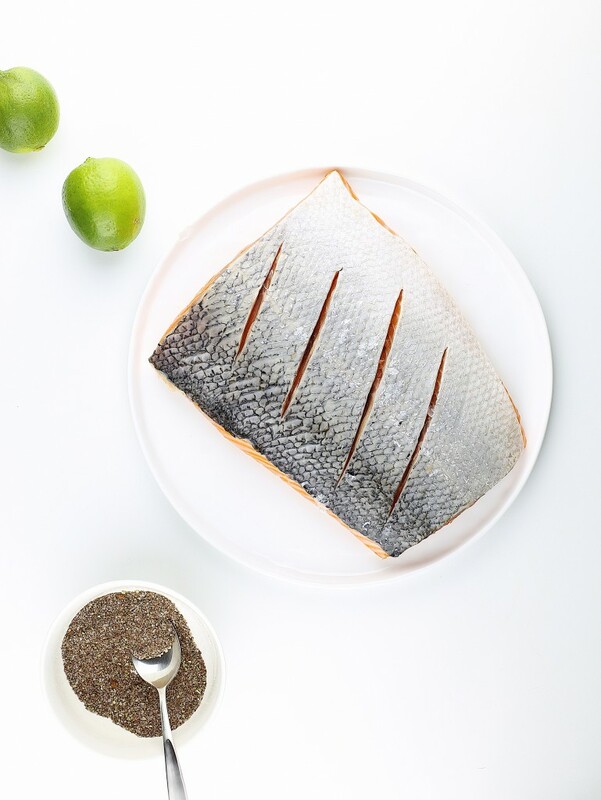 To prepare the salmon, place it flesh side down and lightly score the skin with a sharp knife. 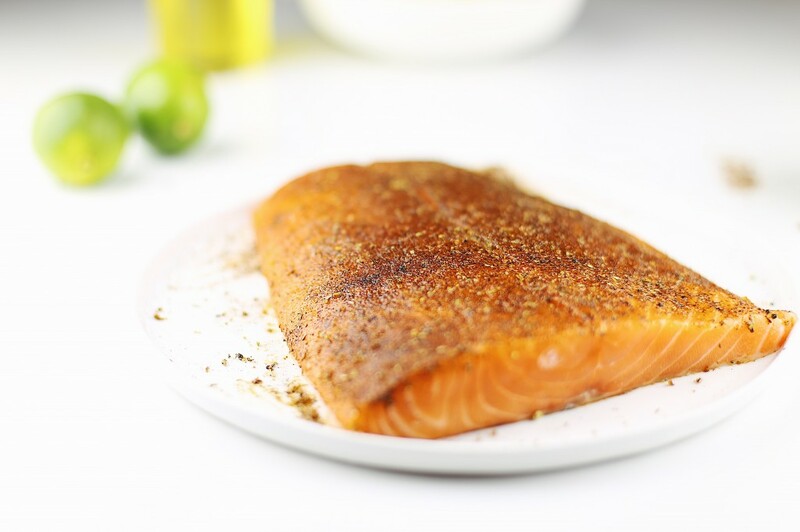 Drizzle olive oil onto the fish and sprinkle the spice rub all over it. You want to do this to both sides of the fish. When the grill is hot, place the salmon on skin side down and then close the grill. Cook for about 20 minutes or until an internal temperature of 125°F for medium rare. When the fish is cooked, carefully remove it from the grill with a large spatula and transfer to a serving plate. Allow it to rest for at least 5 minutes before serving. 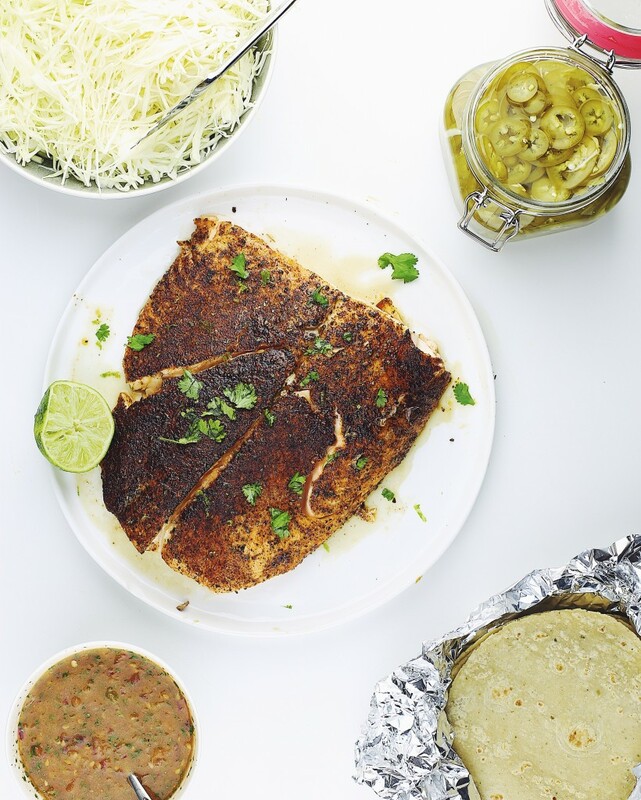 To serve the tacos, place a pile of warm tortillas in foil and allow everybody to tear off pieces of the salmon. Top with the smoky salsa, cilantro leaves, cabbage slaw, and a squeeze of lime. This entry was tagged Salmon, Tacos. Bookmark the permalink.